As my thirties progress and the number behind the 3 in my age steadily rises, skincare (and make-up) have become much more of a feature in my life and definitely my ‘pick-me-up’ purchase of choice. Clothes used to be my go-to for a feel-good purchase but over the last number of years I’ve ended up getting rid of so much stuff thanks to a legacy of ‘feeling a bit blue, happy, tired [insert emotion]’ buying. I’m trying very hard to be more conscious about what I buy and focus on a capsule-style wardrobe over a regular influx of new stuff. I find that volumes and volumes of clothes, shoes, products leave me feeling overwhelmed. Less possessions make for easier clean-up too. Bonus! Streamlining and decluttering is definitely a work in progress, but onwards and upwards eh? Anyway, back to skincare…in keeping with the theme of owning less, I’ve become a lot more conscious about the skincare products I use and hold on to. All (most) of the products that have been languishing in drawers either unused, unfinished or past their sell-by date have either hit the bin or been passed on. Up until very recently, my routine was cleanse, moisturise, use a bit of exfoliating toner if I had one, a dash of eye-cream if I was bothered and SPF when I remembered. It was fine, but haphazard and tiredness often got in the way of application. The bottles looked lovely in the drawer… I’m lucky to have skin that has mostly always been fine causing no real hassles. I would describe it as normal to dehydrated. I guess I became complacent with caring for it over time and thought that lobbing a load of moisturiser on it would generally do the trick when problems arose. Complacency catches up with you in the end though. Over the last year or so I’d really noticed the fine lines around my eyes becoming more pronounced and the lines on my brow becoming more of a permanent feature than just when my eyebrows were raised. Hmmm…it was time to create and stick to a proper skincare routine that yielded results. So, over the last few months, I’ve been trying (and sticking to) a morning and night routine to see what difference it might make. Skincare can be an expensive habit, so along with reducing the volume of beauty products that pass the threshold, I’ve been really trying to take note of price points, minimising spend while getting the best products I can – ones that actually work for my skin and don’t just look pretty sitting on a shelf. Enter ‘The Ordinary’ skincare range…you know the one, minimal packaging, low price points, technical sounding product names, winning all of the beauty awards and hyped to the max. The question is, does it deserve the hype? In my opinion, yes. I’ve noticed a real difference in the texture of my skin using these products. Less dry and brighter with a bit more bounce. A couple of times a week, I use my Clarisonic Mia 2 for a good face scrub but otherwise I cleanse with Sukin Micellar Cleansing Water €7.95 for 250ml. This stuff is brilliant. I discovered it by accident and couldn’t be happier with how it delivers. I’m a convert. I was back in the market for a micellar water after seeing Alessandra Steinherr singing the praises of Garnier’s micellar water. I’d tried it a few years ago, wasn’t convinced, but was open to trying it again. So when placing a recent Boots order, I came across the Sukin cleanser instead and was swayed in an instant. The packaging was appealing and it’s free from nasties, or claims to be at least – I’m no expert on ingredients. Combined with an offer price of €5.30, I was sold. This is a lovely product to use. It glides on, is soothing on the skin and leaves it feeling clean and refreshed with not a bit of tightness in sight. It also helps significantly with the process of waking up. Parenthood has forced me to get better at morning times, but I most definitely still take a bit of time to warm up! Side note: another favourite cleanser of mine, although not in rotation at the moment is La Roche Posay Toleriane Dermo Cleanser €14.99 for 200ml. I had a bad reaction to some products a couple of years ago – think scaly, flaky face – and was recommended this by a pharmacist. It really helped to soothe my skin as it repaired itself. Moisturise step 1, with The Ordinary Hyaluronic Acid 2% + B5 €6.80 for 30ml. After I cleanse I pop this on. It goes on like a dream and soaks into my skin really quickly to allow for a swift move on to the next step – time is of the essence right?! Moisturise step 2, The Ordinary Natural Moisturizing Factors + HA €5.80 for 30ml or €7.70 for 100ml. There’s a nice light consistency to this, the only way to go with day creams in my opinion. There’s nothing special about this cream, but it works and sits perfectly on top of the hyaluronic acid that came before it. The thing with ‘The Ordinary’ products is that they are just that – ordinary. Plain packaging (which appeals to my minimalist tendencies), no scent, no fancy names (or very fancy and technical sounding, to the point where I have to look up what each thing is and what it does). But they work and their price points are just that – on-point. Moisturise step 3, Bobbi Brown Hydrating Eye Cream €43 for 15ml – the product that blows the budget! Next up for the day is a quick dab of this eye-cream. Again, it’s light in consistency, yet effective and acts as a perfect base for concealer as it has a primer in it. I love Bobbi Brown products and used to use a lot more of their skincare until I resolved to find more budget friendly products that work. A little of this product goes a long way so although the price is on the steeper side, it lasts a long time. This product is worth the wallet hit in my opinion. The final skincare step for daytime is SPF with La Roche Posay Anthelios Ultra Light Sun Cream Fluid 50+ €19.99 for 50ml. I use a foundation without SPF so this is an essential. It’s light, blends well and sinks into the skin with a short enough wait-time before foundation can be applied. I like this product, but don’t love it. It’s staying in the routine until I find something better though. I’ve also recently been using the sunscreen face mist in the Anthelios range €14.99 for 75ml – it’s great for applying top-up sunscreen while out and about or over make-up. Just don’t breathe in when spraying it! In other news, The Ordinary are bringing out a new sunscreen range with SPF options of 15, 30, 35 and 50. Apparently they’re coming soon… As soon as they’re out, I’ll be putting in an order. So that’s the morning routine, pretty fuss-free, taking a grand total of two minutes in between sups of coffee and slurps of smoothie. Evening times were really where my skincare routine fell down. Tiredness and laziness, what can I say? Some of the skin cleanses that took place were perfunctory at best. Rap on the knuckles for me. To help with sticking to my newly (re)formed skincare routine, I now keep all of my skincare products on my bedside locker instead of in the bathroom, so I can be half asleep and still take care of my skin. Anyway back to the products for my evening routine; a number of those from the matinee show reappear with a couple of newbies with different ingredients thrown in. I cleanse with the same Sukin Micellar Water as morning before moving on to tone with with Pixi Glow Tonic 5% Glycolic Acid Exfoliating Toner €23.50 for 250ml. This is another product that I really enjoy using. Following the micellar water, it adds another layer of freshness to my skin while gently exfoliating. It has a gentle scent which I find very appealing, although I have heard others say they’re not huge fans of the smell. It works for me though. When I first started using this, I noticed some very gentle flaking on my skin as the top layer of dead skin lifted, but this settled down very quickly. I use it most nights now, but I think it’s best to start slowly with this product so your skin can adjust to it. The price point, although not bad, is a little higher than my new budget routine should allow so when I run out of this I’ll be giving The Ordinary’s Glycolic Acid 7% Toning Solution €8.70 for 240ml a go. I’ve read some great reviews of it. Moving on to final steps of the day, moisturiser. Step 1 takes the form of The Ordinary’s “Buffet” Multi-Technology Peptide Serum €14.80 for 30ml. This stuff is brilliant. According to the brand, ‘This formula combines a comprehensive array of studied technologies to target multiple signs of ageing at once’ and I bloody believe them. I’m putting the retreat of my fine lines down to this little bottle of joy. I can’t recommend it highly enough. Step 2, the penultimate step is a quick swipe of a few drops of The Ordinary 100% Organic Cold-Pressed Rose Hip Seed Oil €9.80 for 30ml. This is pretty much the same as Trilogy’s Certified Organic Rosehip Oil at a fraction of the price. I like to use an oil as an almost final step as it gets to work over night and by the time morning rolls around, your skin is left feeling supple, even if the rest of you feels like you’ve done ten rounds! Finally, it’s a couple of dabs of the same Bobbi Brown eye cream used in my morning routine before I face-plant onto the pillow and head off to the land of nod. Now, in the interest of full disclosure, I must admit that there is a celebrity guest that gets drafted into the routine every now and then. 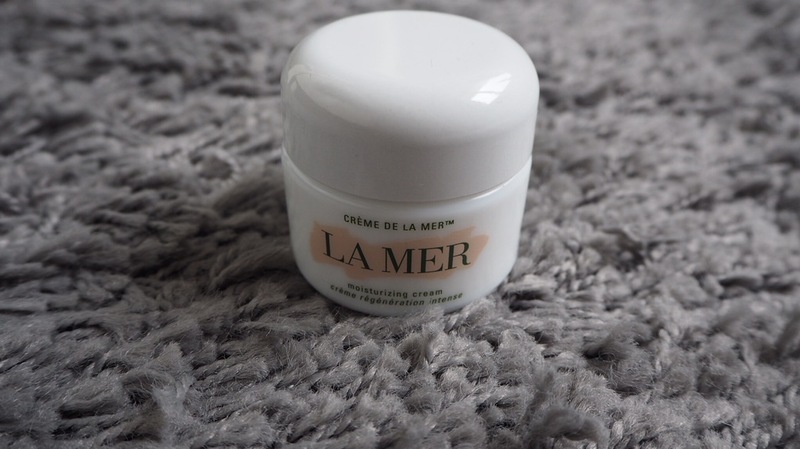 I was lucky enough to be gifted a pot of Creme de la Mer Moisturizing Cream €140 for 30ml [argh!] for mother’s day – at two, I’m not sure how Evie knew, but it seems she’s honing her beauty shopping skills at an early age. If my skin is feeling really parched, I use this for a couple of nights and my skin is right back on track. So there you have, a skincare routine that is enjoyable to use, relatively easy to stick to and doesn’t contain too many products. And the products that are there won’t break the bank. The eight products I use daily come to €131.64 when bought together and they last a decent amount of time. If I was to swap out the Pixi Glycolic Toner for The Ordinary’s version and find a cheaper alternative for an eye cream that total would reduce significantly again. I think with brands like Deciem’s The Ordinary appearing on the market, there’s finally a real alternative to expensive luxury brands that allow us to create a multi-step skincare routines that work. If you’ve been wondering about The Ordinary’s products and fancy giving them a go, just do it. It can be difficult to decipher which products do which job at first and in which order they should be used, but they have a really handy regimen guide that gives suggested routines for whatever your skin problem is. This is where I started before I felt braver trying different products in their range with subsequent orders. I order all of my products in a batch straight from their website. Orders over €25 (I think) have free delivery. I know that I’ve never been charged delivery and my orders have always been around the €30 mark.